I’ve mentioned here before that I’m a relentless perfectionist. I approach work and play as all-or-nothing endeavors in which I’d rather not play than play badly. It’s a personality flaw. I’m working on it, and probably always will be working on it. 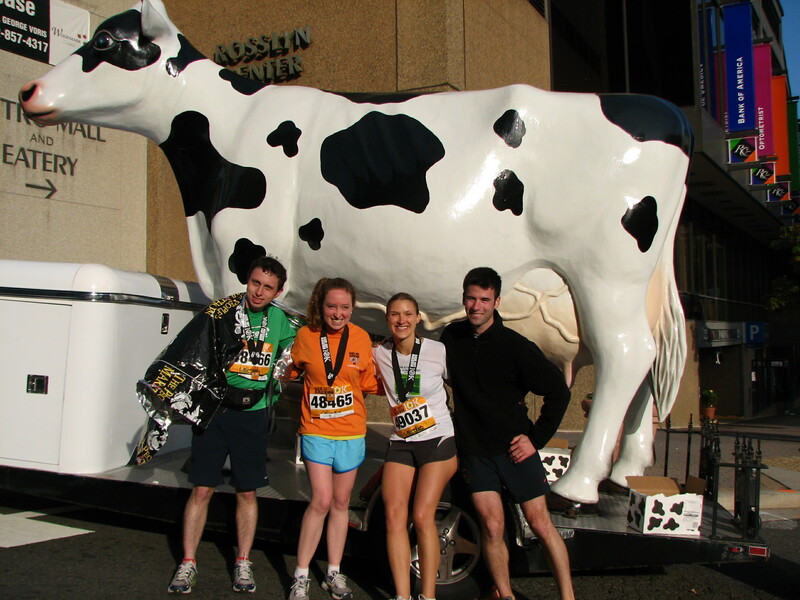 Posing with the "Udder Cream" cow at the Marine Corps 10K finish festival last year. This week, I’m working on it by fully committing myself to training for the Marine Corps 10K. I’ve been signed up for the race for weeks, and have been running with a greater sense of purpose ever since. I’ve been adding miles, hills and speed to the lovely, calm 30-minute trail runs I did for most of the summer, when I was fooling myself that I could go on lovely, calm, 30-minute trail runs and still run road races quickly. Here’s the part that’s tricky for me: I’m still on the slow side of my own personal slow-fast running spectrum, and it’s unlikely I will regain that speed in the next two weeks. I’ve been known to approach this kind of situation as any good perfectionist would: by saying the race is a training run, and by jogging the whole thing to save myself from “failing” with a slow race. There’s nothing wrong with treating a race as a training run. But I think there’s a difference between jogging a race (which there’s also a time and a place for) and treating it as a training run, with real goals and training objectives. I tried my absolute hardest at the Bolder Boulder 10K, and I was still slow. And that's totally OK.
And so, I’m making a commitment to myself to treat this race as a tempo run, and to accept the fact that my current tempo-run pace might be 9-minute miles. When the race is done, no matter what my time, I’ll be proud of the effort I expended and the fitness I gained by actually accepting where I am today rather than wait to expend real effort until I’m an 8-minute-miler again. Are you a perfectionist in your training and racing? How does that manifest itself, and how do you work to overcome it? I like your approach for the MCM 10K. It sounds really healthy. This blog speaks to me because I just very recently realized how much my perfectionism is hurting me, rather than helping me, as a runner. To answer the question– how do you work to overcome it? I have already overcome a lot by not following a plan that has every day mapped out. Taking training one day at a time helps a lot, but I still have a long way to go. Knowing is half the battle! Good for you going in to race it, no matter what shape you’re in. Who knows, you could surprise yourself after all. I ran the Long Beach half this past weekend with a friend from Twitter. She was recovering from an injury but was still hoping for a PR. This wonderful woman wanted to desperately to do “Well”, even though she hadn’t be able to train during the past months. Both of us share a love of the Grateful Dead and we got into a discussion of the Grateful Dawg Movie and how David Grissman would agonize over playing every note perfectly and how Jerry Garcia had the attitude of, “it’s just a note. If you mess one up, you move on to the next.” That sums up running to me; sometime I run well, sometimes I don’t. If I don’t do well, I just enjoy what I can and move on to the next run. The question becomes one of, how do I find joy in this sport I love?” A trail race is alway a way to get back to nature and experience sounds and smells in places I wouldn’t normally go. Trail races are for getting lost and getting dirty and getting feet wet in cold streams. My wife is running her first 10K this weekend at of all races, the Marine Core Buffalo Alley 10K trail run. First mile is straight up. The last mile is straight down. She’s going to have trouble finishing within the time limit, but I will run right besides her the whole way. That for me is a PR. 🙂 Good luck this weekend. Enjoy yourself.